The fountain in the Plaza Las Delicias – the cathedral to the left and the firehouse to the right are visible, just, in the background. Even when you live on an island, it isn’t always necessary to get on a plane to pack your bag and travel! Granted the distances aren’t far – but the psychological benefits are much the same, perhaps better: Calculate the cost-benefit ratio! 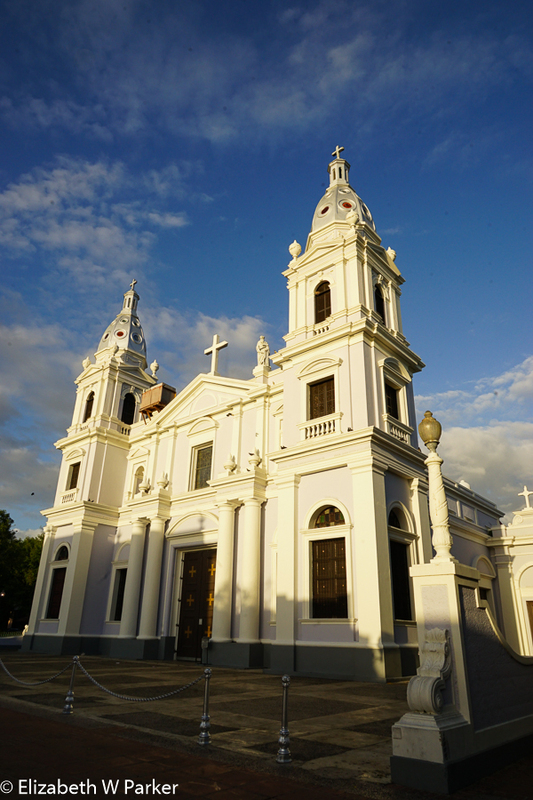 The cathedral of Ponce in the late afternoon sun. I had just such a “backyard” adventure – right in the middle of the week. I needed to go to Ponce, PR to pick up merchandise from a couple of our artisan suppliers, so I packed some pjs in my backpack, grabbed my camera, commandeered my chauffeur (husband! ), cranked up the engine, and took off for Ponce on a Tuesday afternoon. We visited the suppliers, a wooden saint carver in el Tuque, and a papier mache mask maker near Playa de Ponce. Then we headed into the center of town. Requisite shot of the Ponce Firehouse! Our hotel, the Melia Century, is located just steps from the famous firehouse. We had a beautiful, if small, room that was immaculately clean, with a balcony overlooking the street. 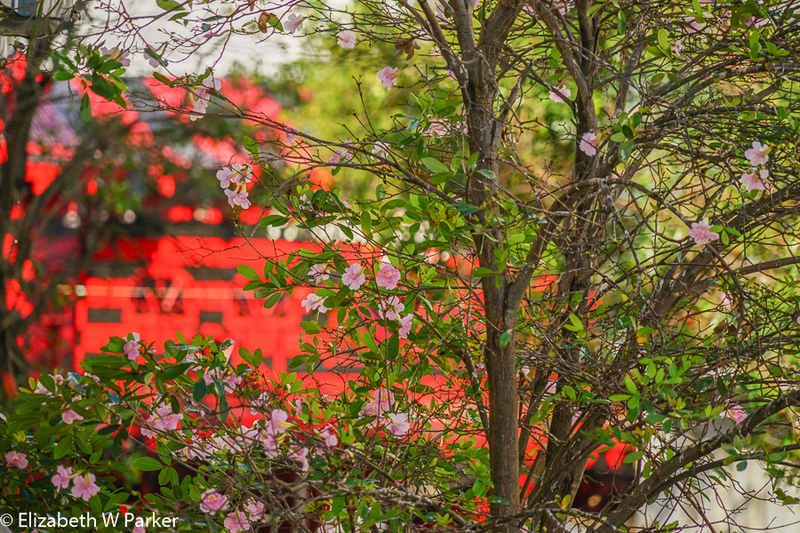 The black and red of the firehouse was visible behind the “roble” blossoms [Tabebuia roble or rose trumpet tree]. 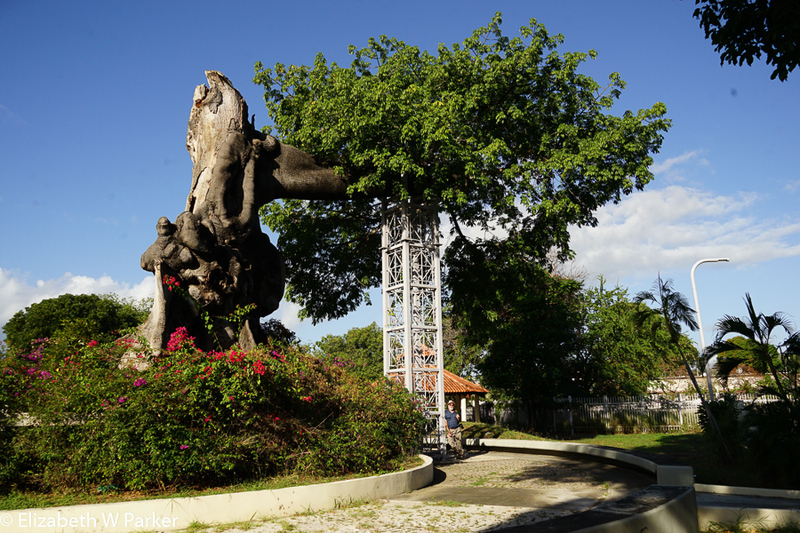 The Ponce Firehouse behind the “Rose Trumpet Trees” that line the street. 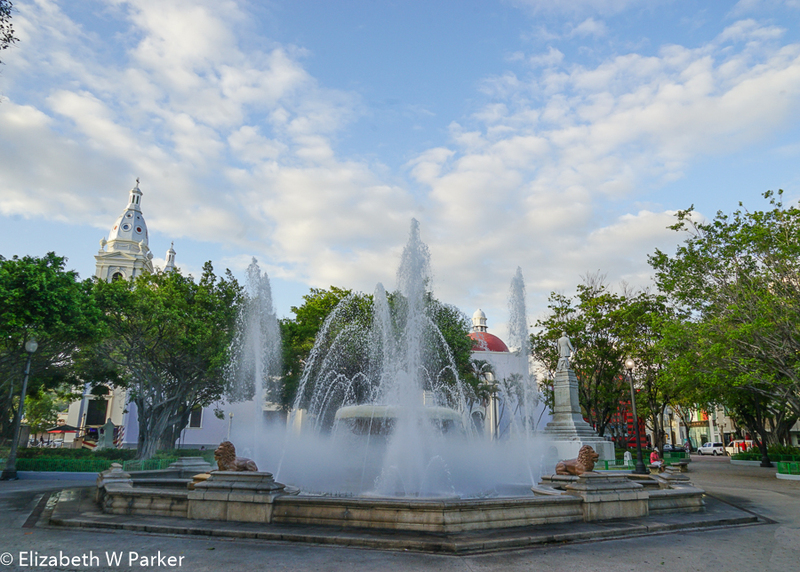 Our first camera foray took us to the Plaza las Delicias to shoot the iconic firehouse, the fountain, the city hall and the cathedral in the late afternoon. We shot no blockbusters but we got additions to our stock photos. When we tired of taking pictures up there, we returned to the lower part of the restaurant (the upper part was closed on a Tuesday evening) and sat out on the terrace to have dinner. Our table was perched right above the firehouse! The sunset was directly in front of us with the plaza (firehouse and cathedral) in the foreground. Wonderful and romantic, the food was good too! I was worried, but the chef concocted a Vegetable Mofongo for me that was really something to write home about (or write a blog post about?). The mofongo (mashed plantains) was moist and chewy, and I would guess that the cooked mixed, fresh vegetables had something like an ajillo sauce (garlic, thyme and sherry). It was not on the menu, but if it sounds good to you, ask for it. 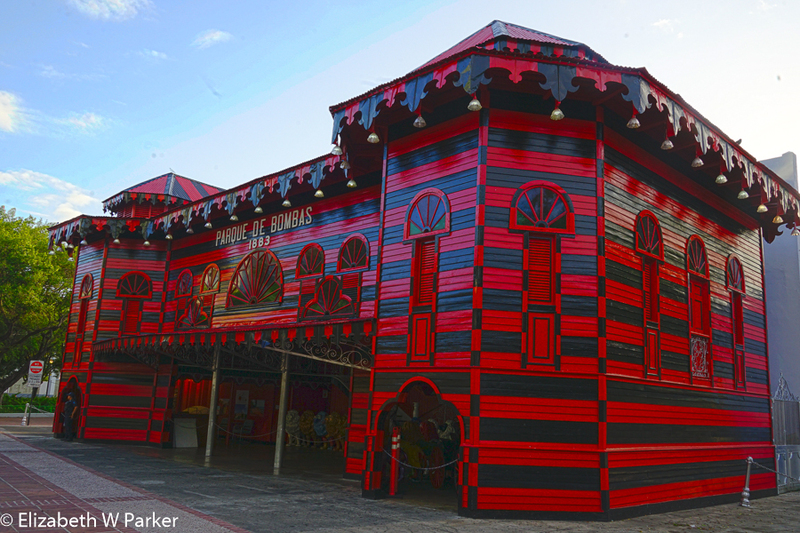 The Ponce Firehouse is unique at any time of day! 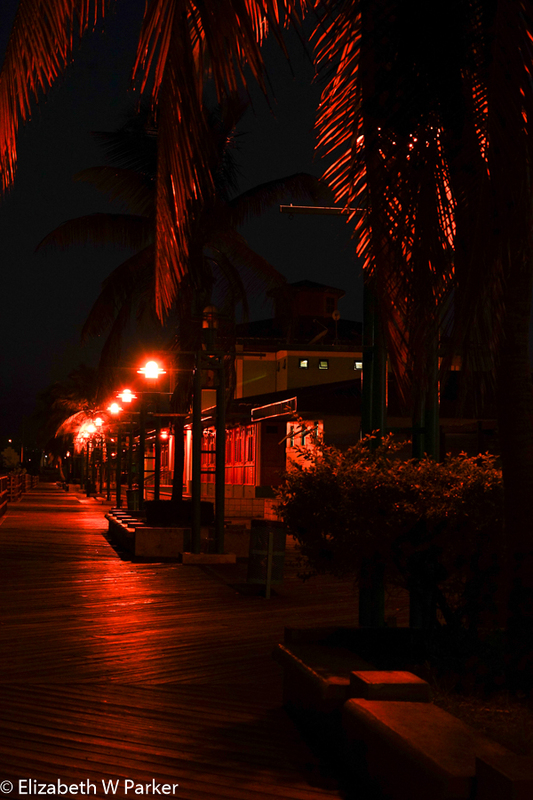 La Guancha is deserted in the predawn hours. Wednesday morning we got up about 6 am to go to La Guancha to take pictures of the sun rising. It was still dark. Sunrise was scheduled for 6:35. There wasn’t anything going on at La Guancha at that hour – probably a better bet in the evening when it would be full of people. But to the left of the little harbor there is open sea. A beautiful stretch of sandy beach is broken by mangroves and stunted, yet fantastical trees, silhouetted against the water. It is one of my favorite places. And, this morning, to make a good thing better, we had a spectacular sunrise to photograph, too. We lingered, walking along the beach, snapping the same sunrise shot over and over as each little change appeared more beautiful than the one just before it. Starting the day with a sunrise puts a glow on the entire 24 hours to come. I left with a happy heart, and a growling stomach, ready for a look at the plaza at dawn and breakfast back at the hotel. 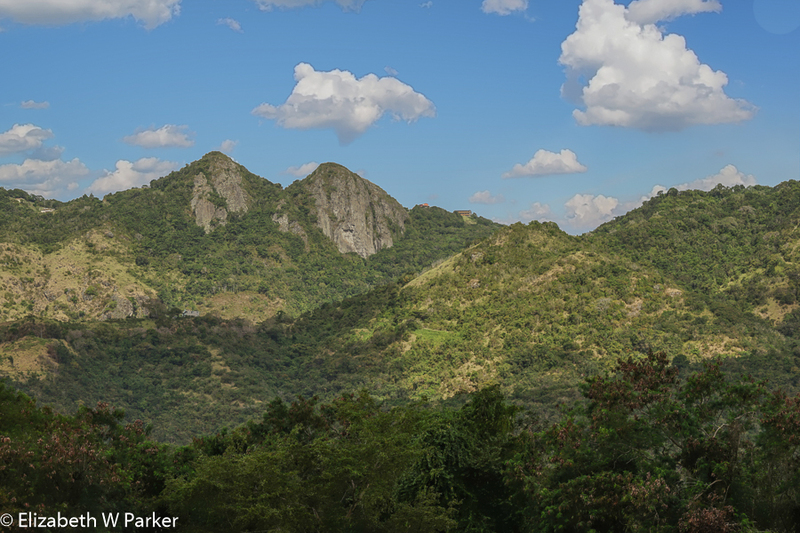 Famous view of the mountains of the Cordillera Central on the way back to San Juan. 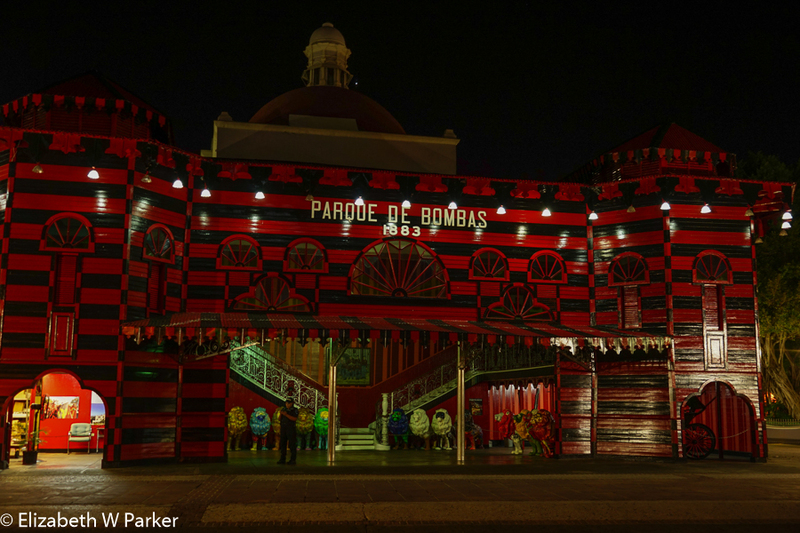 For other, older posts about Ponce, click here.